Feeling they could talk the new owner into letting it go, Kele picked up the phone: “Hi, Dad.” Kele’s father—a general contractor who had purchased the house as a flip with Kele’s mother—not only agreed to sell but signed up for a major remodel too. “Looking back, I think that was his plan all along,” Kele says. 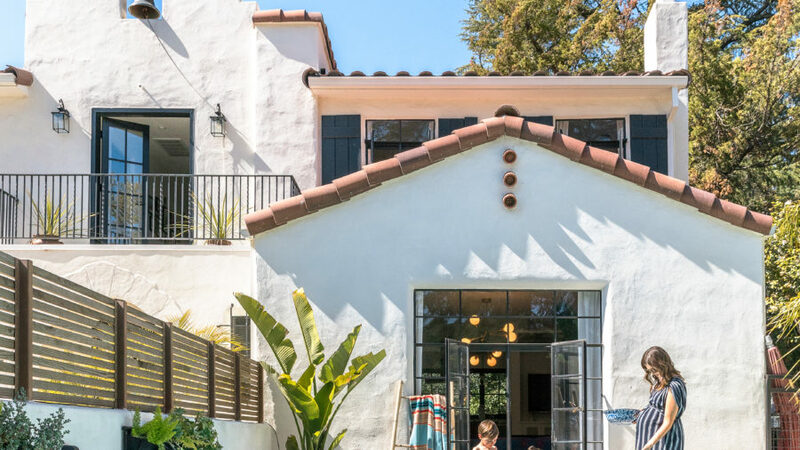 The original 1,900-square-footer (just a mile from Kele’s parents) was in need of a sweeping remodel, it possessed an architectural style that they were drawn to—not to mention a yard with tons of potential. So the Dobrinski clan got to work to create a home that reflected its historical roots and their own personal style, with unconventional choices like a pool in the front yard. The cactus print has a playfulness that knocks a few years off the house. “It was the right amount of space to take a risk like that,” Christina says, “because it’s not a huge expanse of wall.” The original wrought-iron stair rail makes for a grounding counterpoint to the white walls and wallpaper. White paint saved the quirky carved wood mantelpiece from getting torn out and replaced with something modern. Without the fresh coat, the fireplace looked heavy and dated; post paint job, it completely jibed with their vision. Kele’s great-grandmother’s vintage armchairs were reupholstered in cobalt blue fabric. The Dobrinskis brought the table and high-back cane chairs from their old place, then added the bent- wood seats for a casual mix. Large-scale cement tiles on the floor balance the coffered wood ceiling— and make floor clean-up a breeze. The open ceiling of Douglas fir is perhaps the home’s most unexpected feature. “My dad told me over and over again, ‘They don’t make wood like this anymore,’” Kele says. The kitchen island serves both as central gathering spot and style lodestar, with black-and-white cement tile that supplies the contemporary edge the couple was looking for. “Sometimes Spanish homes can feel weighty,” says Christina. “We wanted it to be young and fun.” In the kitchen, repurposed glass-front cabinets keep the mood light and airy, as does the new window the couple added over the sink. When the county required updating some of the metal windows in the back of the house, the couple saved them to reuse here in the workspace above the garage. Old beams were repurposed into an 18-foot-long shared desk. The dining room doors open out onto the deck overlooking the firepit, so Kele wanted to give the sightline visual punch. The solution: more eye-catching tile. Small raised beds house lettuces, herbs, and a Meyer lemon tree, all of which are regularly plundered for pizza toppings.